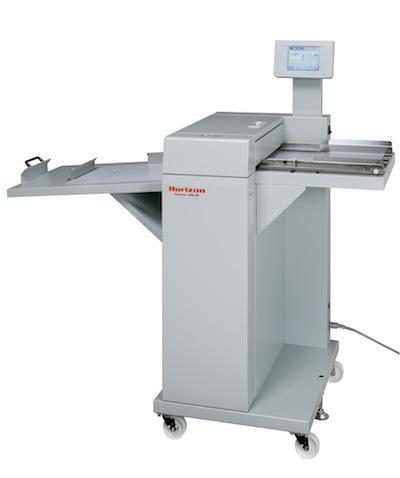 The Horizon CRB-160 is a cover creaser that communicates with BQ-160 series of perfect binders to eliminate the problem of image cracking of heavier covers and digital printed sheets. Even heavy-weight cover stock can be used to build crisp, clean and tight books. The CRB Creasers can be set-up through the BQ-160 color touch screen. Impact scoring position is set automatically according to the book thickness inserted into the BQ-160. Clean and sharp impact creases can be made even with heavier and laminated stock. Stand alone model is also available with an integrated touch screen operation console. A wide variety of impact scoring patterns can be selected from the touch screen. Suitable for crease covers, restaurant menus, greeting cards and all digital print applications.